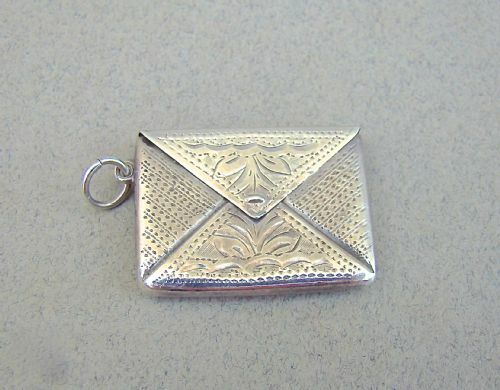 This is an exquisite Art Nouveau sterling silver envelope stamp case made by the prolific Crisford & Norris and dated Birmingham 1916 . Modelled as an envelope, the cover applied with the lettering "stamps" in the Art Nouveau style, within a decorative border. Date letter "r" for 1916. Postage overseas: £7.00 Standar parcel. 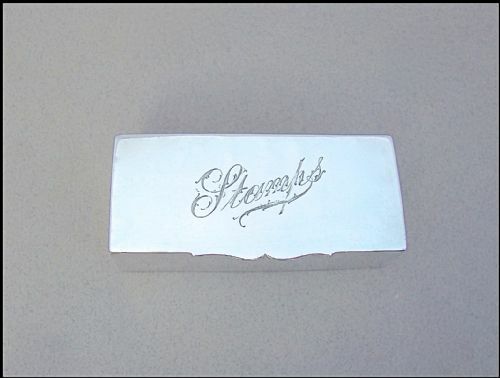 This exquisite and very collectable silver stamp case in the form of an envelope dates circa 1905. The front cover finely engraved with foliate sprigs within a bright-cut border. The back with conforming decorations surrounding a vacant reserve. 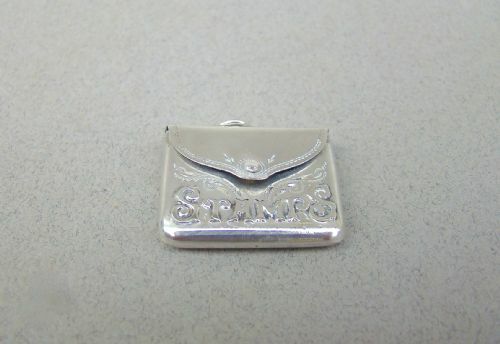 STERLING SILVER impressed on the inner sleeve. Postage UK: £5 Recorded 1st Class. 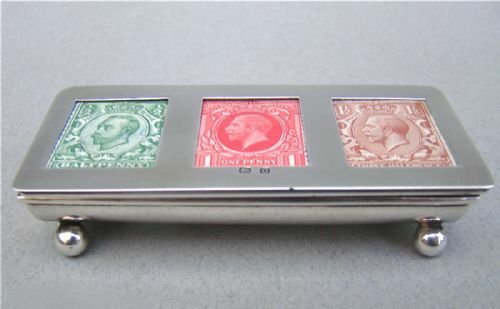 This is a rare and fabulous Edwardian silver two compartment stamp box complete with glass barrel shaped moistener. The sloped sprung hinged cover opening to reveal a gilt interior. 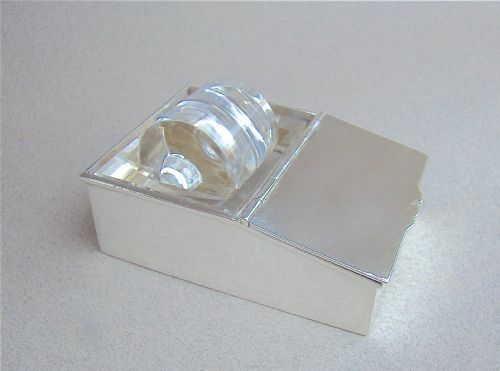 The tubular glass barrel shaped moistener housed in a separate rectangular tray. D&F for Deakin & Francis. Date letter "e" for 1904. Maximum height: 4cm / 1.2 inches. 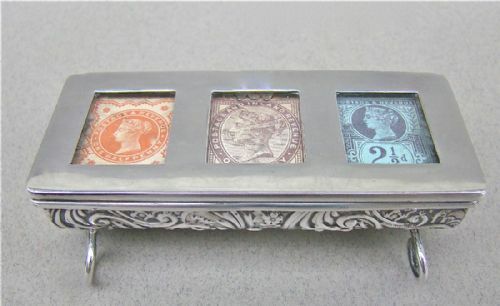 This exquisite and very rare silver triple stamp box has a lovely semi-circular form. The glazed lid encasing three original stamps. The sprung hinged cover with generous borders. The base profusely embossed with foliate decorations and raised on four wirework loop feet. Date letter "x" for 1897. Length: 8.5cm / 3.2 inches. Width: 3.5cm / 1.3 inches. Height: 2.5cm / 1 inches. Sprung lid in perfect working order. 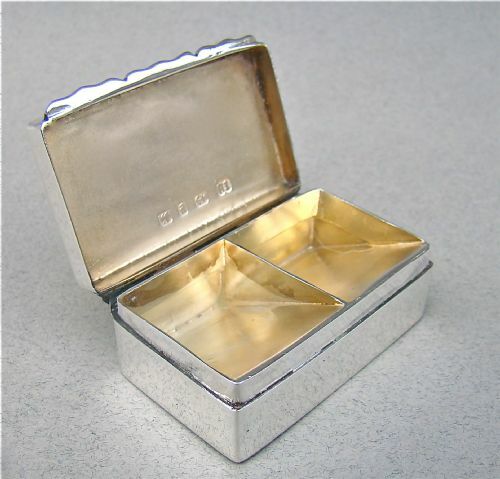 This is a fabulous and very unusual solid silver double stamp box. Of rounded rectangular form, the domed cover fitted with two stamps. The cover has a hinge at the base opening to reveal a gilt interior. The back with two slits to insert the stamps on display. WH in quatrefoil punch mark for William Hornby. Date letter "h" for 1903. Height: 4.5cm / 1.6 inches. This exquisite triple stamp box has a lovely semi-circular form. 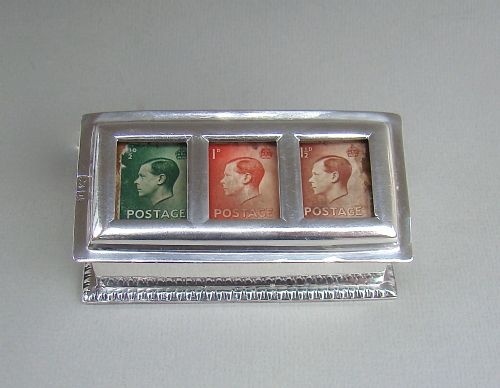 The glazed lid encasing three original stamps. The cover is lined internally with the original handmade paper. A&LLd for Adie & Lovekin. Length: 7.5cm / 3 inches. 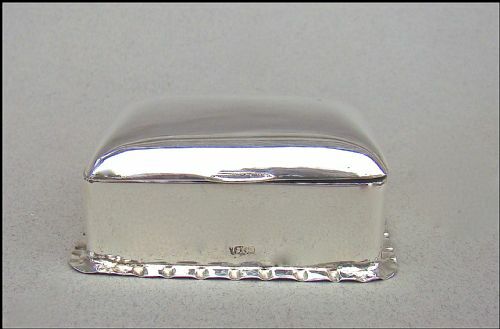 This simple and elegant triple Victorian solid silver stamp box is dated London 1898. 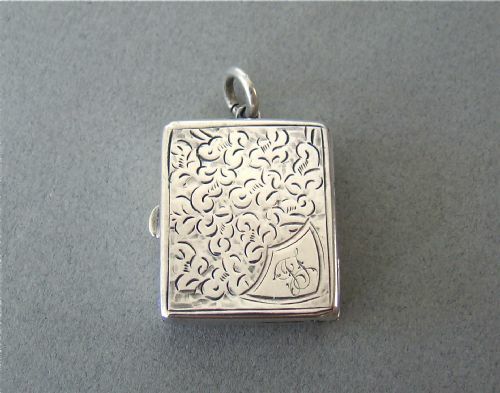 Of rectangular form, the hinged cover engraved with the lettering "stamps". The shaped thumb-piece opening to reveal three sloped compartments for stamps. The base engraved with retailer's marks. 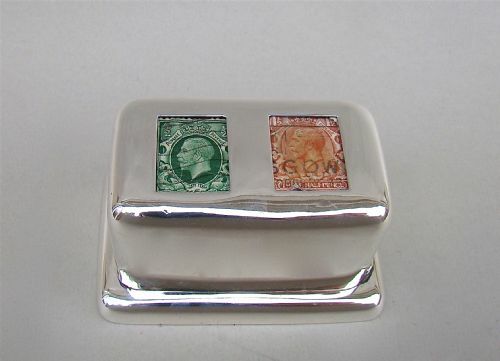 This is a very decorative Victorian solid silver triple stamp box.The sloped glazed lid encasing three original stamps. The cover is lined internally with the original maroon Morocco leather. The base with a fine gadroon border, the hinged cover with plain border. The underside lined with leather. Date letter "d" for 1899. Width: 4cm / 1.6 inches. Some minor unevenness to the upper border. Gilt interior a little faded. This exquisite double stamp box has an elegant outline. Of plain rectangular form with a delicate thumb piece opening to reveal two sloped compartments for stamps. Date letter "y" for 1898. Length: 4.5cm / 2 inches. Width: 3cm / 1 inches. 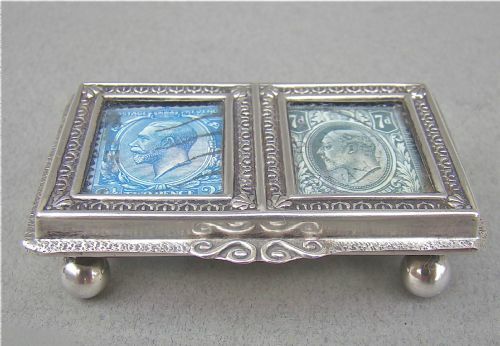 This is an exquisite novelty Victorian silver stamp case made in 1898. The engraved hinged cover opening to reveal an engine-turned sovereign action stamp holder. Fitted with a suspension loop. Initialled cartouche to the front. Maker's marks are double struck hence difficult to identify. This exquisite double stamp box has an elegant outline. Of plain rectangular form, the domed cover with a delicate thumb piece opening to reveal a rich gilt interior with two sloped compartments for stamps. The base with a decorative pinched border. A.W.P for Arthur Willmore Pennington. Date letter "s" for 1892. This exquisite and rather unusual double stamp box has a lovely semi-circular form. The glazed lid encasing two original stamps. The sprung hinged cover engraved with intricate borders and thumb piece . Date letter "d" for 1903. Height: 2cm / 0.5 inches. Minor dings to base commensurate with age.